Gluten free is a label that doesn’t instil alot of confidence in what I’m about to eat. Especially when it’s a baked product, like a pizza base. But making the whole thing grain free, well there’s a novel concept which just makes me curious. I recently bought the I Quit Sugar For Life cookbook, it’s filled with some pretty awesome looking food. 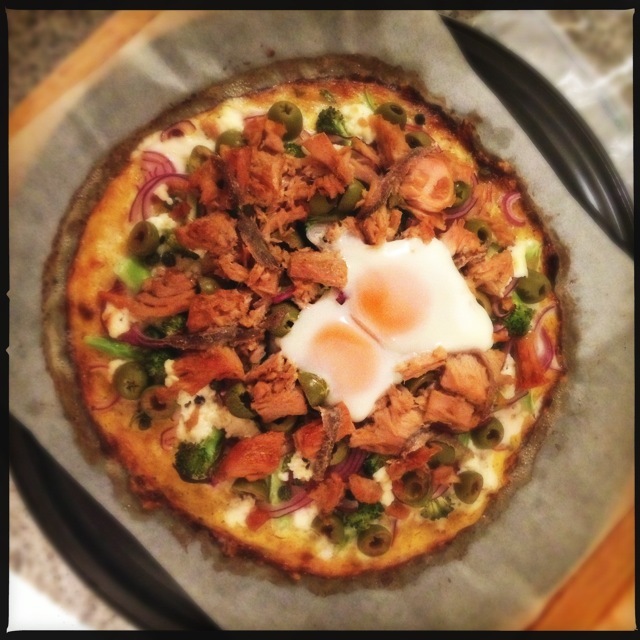 But this “pizza” caught my eye, which used cauliflower to make the pizza base. A friend had given this idea a test run a few months back but wasn’t impressed with the outcome. But I just had to try for myself. 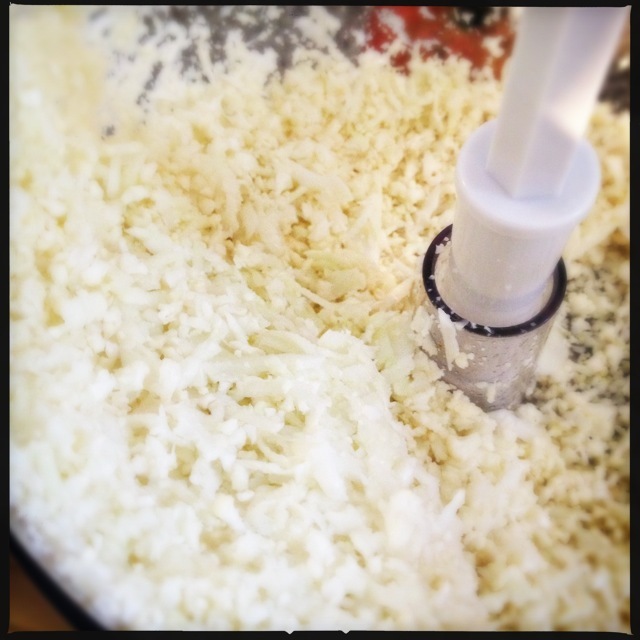 The base is made by grating cauliflower (using a food processor or by hand) into “rice” which you then cook. This is then mixed with cheese and an egg then shaped and baked. The grating alone was a pretty satisfying experience. The texture of the cauliflower afterwards was quite unique. The smell of the base cooking was like cauliflower cheese. 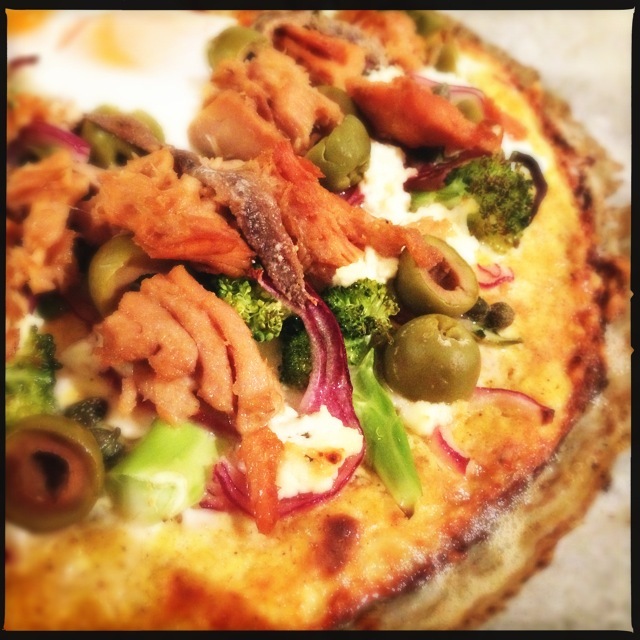 The recipe in the book makes the pizza a Nicoise like pizza, with toppings of anchovies, tuna, egg, olives, capers, red onion and broccoli. The sauce is a mix of yoghurt and curry powder. It was a bit of a salt overload, and I thought it a bit OTT to see they suggest finishing off the pizza with a bit of salt and pepper. Either way, this is going in the mental bank of cool things to do with cauliflower (that list seems to get longer and longer!). 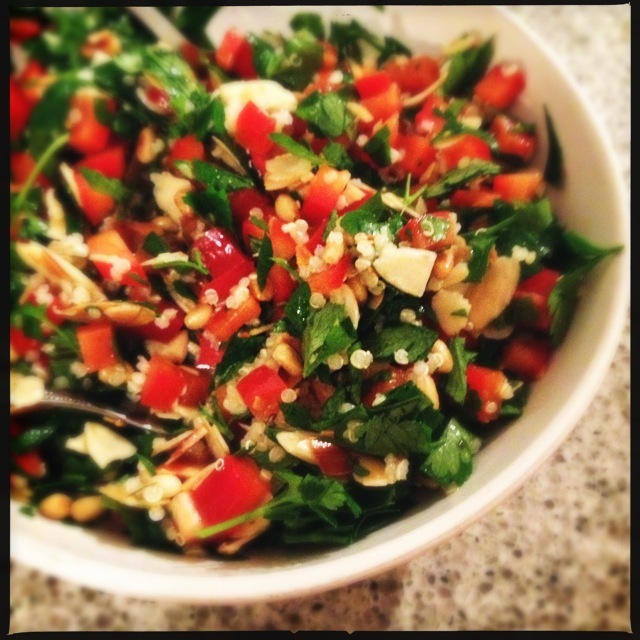 I also made a capsicum tabouleh to have on the side which was some fresh lemony relief from the salt of the “pizza”. I was way too full though to appreciate it. One to make another day. We have a great big lot of parsley growing in our garden, so an easy thing to make at the last minute. The recipe uses quinoa instead of cracked wheat. The one thing missing was some kind of onion, thankfully I always have spring onions in the fridge so I chopped one up and chucked it in. Just the right amount. Affordability : MODERATE. Cauliflower ain’t cheap at the moment! And thankfully I have a well stocked pantry/fridge with plenty of salty condiments. To make this tonight I only had to buy the cauliflower and broccoli for the pizza and the capsicum for the salad. Time Factor : MODERATE. If you didn’t have a baby this would be alot faster as you could just plonk yourself in the kitchen for the evening. I took my time and spread out the tasks through the afternoon. The base is a little time consuming with the grating, then cooking the cauliflower, shaping the base then baking the base for 30 minutes. Once baked and topped the pizza is then in the oven for around 10 minutes. Complexity : MODERATE. Just a bit fiddly and a few steps initially. If you had bigger kids they could help with making the base or topping the pizza. Deliciousness : EXCELLENT. Was really impressed with how this turned out. Just don’t expect normal pizza. It doesn’t really taste like pizza but it seriously is delicious. The edges of the crust especially. Lego man suggested we make them donut shaped next time to get maximum crust value. I will be suggesting this to my gluten free friends. Possum Friendly? YES. The base yes, the toppings tonight no. Way too much salt for anyone really! To make it Possum friendly a topping of broccoli, tuna and onion would suffice. Would I make it again? Yes, gone into the mental bank. I am going to set a challenge for myself every now and again. 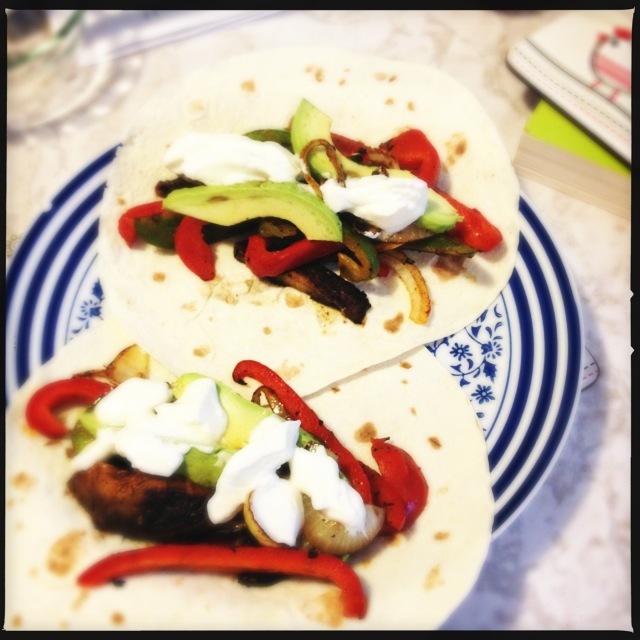 To use up the leftovers in the fridge in a creative kind of way. Tonight is night one! I had high hopes and big plans. There was going to be the carrots from last night, with the roast lamb, and cous cous and currants, and tomato and garlic. And it was going to be magnificent! And Lego Man would rejoice at what a wonderful wife he had married who could do such amazing things with leftovers. And then Possum’s bed time came. And took nearly an hour. And Lego Man was going to be stuck at work until really late. So leftover challenge #1 for one. It had to be quick as my stomach was rumbling while sitting in with Possum. Once out of her room I started to think, but all I could think with was my tastebuds and my very hungry tummy. The decision was made not to order every deep fried entree off the thai take away menu (as much as I would have gobbled it all up). Instead I would actually do the challenge. So I made an omelette. Not very original or exciting use for leftovers. I remember reading in Anthony Bourdain’s books “Kitchen Confidential” that you should never order the “omelette special” on a Monday, it is just the restaurant doing their own Leftover Challenge. Omelettes always make me giggle after watching the TV series “Gavin and Stacey“. Apparently there is a drinking game where you have to take a shot every time you hear the word omelette. My omelette had onion, roast lamb and potato in it. A bit heavy, so i had a big serve of leafy greens next to it. It was pretty tasty and tummy filling. Not a bad start. Though it did end up taking alot longer than I expected. 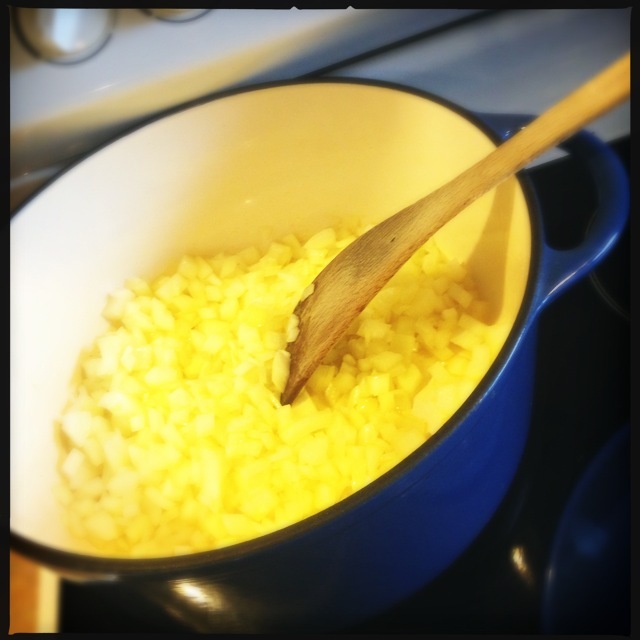 Once again, I underestimated the time it takes to cook onions. Thankfully our fridge and cupboard have a variety of snack options that kept me going. Affordability : EXCELLENT. A couple of eggs and some leftovers. Too easy. Time Factor : MODERATE. Using spring onions instead of brown onions would’ve made this a heck of a lot faster. Complexity : LOW. Everyone should know how to make an omelette. I use a cheap little fry pan from Ikea which works a treat. I cook the eggs on low until you notice the edges starting to cook. Then sprinkle with grated cheese and place under a hot grill for a few minutes. The top will puff up and brown nicely. 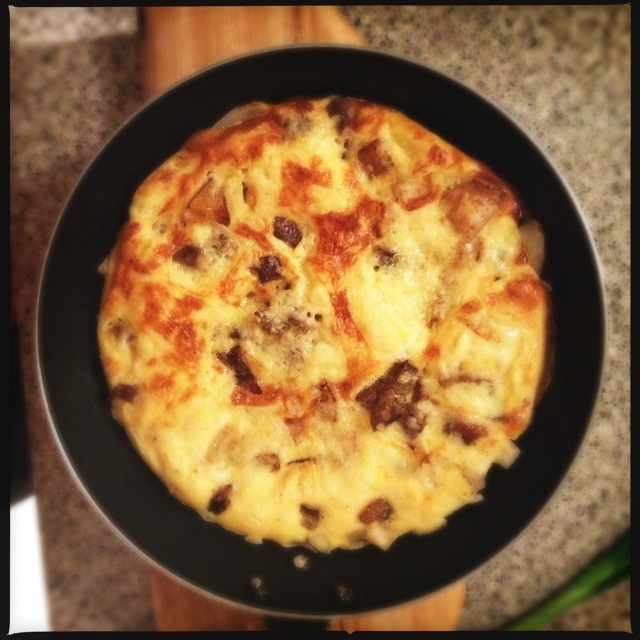 Light fluffy omelette, ta dah! 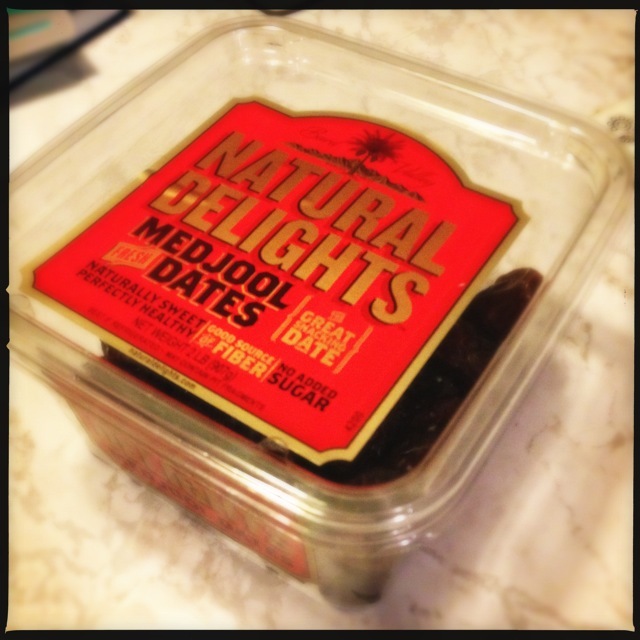 Deliciousness : MODERATE. Filled a hungry belly and was tasty but nothing to make me go wow. Mess : LOW. Chopping board, knife, frypan and cheese grater. Tummy Filling Factor : MODERATE – EXCELLENT. Feeling nicely full but not entirely satisfied. Possum Friendly? NO. Bubs apparently find digesting egg whites difficult, but egg yolk is a great baby food. Possum had an egg yolk and spinach pancake today at dinner (I used the remaining egg white in my omelette). I also am avoiding serving Possum dairy, so no cheese for Possum. Would I make it again? Maybe. I will most certainly end up making an omelette again. Chicken salad was swapped to Apricot Chicken tonight. A good decision. What a wonderful day of steady rain. We have corrugated perspex outside and the sound of the rain on it is just lovely. Possum and I had a fun day together at swimming, plus she is mobile enough now to follow me (very slowly) when I go to another room. This new found mobility (in the form of a semi commando crawl) also means she sees me at the stove and wants to hang out at my feet. Not so great when you’re browning off chicken legs and there’s hot fat spitting everywhere. Thankfully tonight’s dinner was a slow and steady concoction which allowed play time, reading the same book 10 times in a row, singing songs, and cuddles in between chopping 6 onions (yuck! 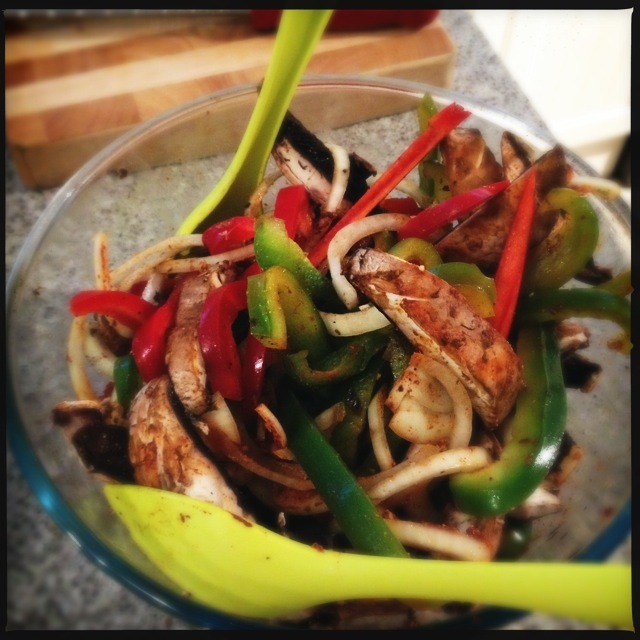 ), slicing and deseeding 4 chillies and handling raw chicken. Needless to say I have washed my hands more times today than I would working in an intensive care unit. Affordability : EXCELLENT. Feed meat to 5 people for $10? Done! Thankfully apricots were on special this week, which I why I did the old swaperoo with the chicken salad. Time Factor : LOW. Probably quicker if you don’t have a 9 month old baby/shadow. I reckon you could make this a “chuck it all in the one pot in the oven” wonder though. I always drastically under estimate the length of time it takes to brown meat and soften onions. Complexity : LOW. Not much more to say on this one. Deliciousness : EXCELLENT. This was delicious!! I am a big fan of the meat and fruit combo though (think Persian). Tweaked the original recipe a little, they said to take out the meat, olives and apricots to thicken the sauce. I thought “but that’s all the best bits!”, so only took out some of the apricots and let the rest turn to jammy mush. Win. Mess : MODERATE. One pot. Lots of onions, lots of chilli seeds, lots of oil splatter. Tummy Filling Factor : EXCELLENT. After having “lighter” meals the past few nights this was a nice hit of protein and carbs. Very full! Possum Friendly? MODERATE. I would be happy to peel the meat off the bones for her to try. But no good veg options tonight. Would I make it again? Yes, but would try just throwing it all in the pot together. Heat a large, heavy-based pan over medium heat and brown the chicken pieces. Set aside. Heat the oil in the same pan then add the onions, chillies, oregano, cumin and salt. Turn the heat down to low, cover and fry gently for 5 mintues, then uncovered and continue frying, stirring frequently, for about 30 minutes or until very soft. Nestle the chicken, apricots and olives into the onion mixture then pour in the stock. Bring to a simmer, cover and gently simmer for 20 minutes, then uncover and simmer for a further 10 minutes. At this point, remove the chicken, apricots and olives and keep warm in a low oven then bring the sauce to a boil and reduce to thicken. 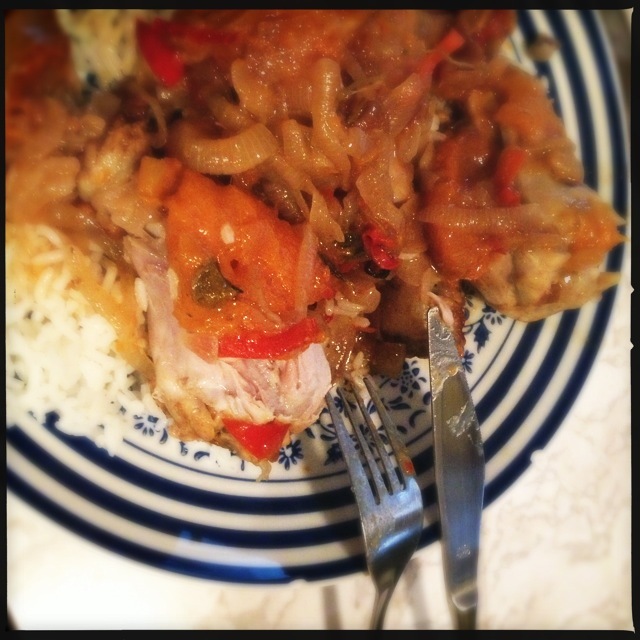 Pour the thickened sauce over the chicken and remove the oregano stalks before serving. Something I love about cooking is the entertainment of my senses. Generally you get to eat something yummy at the end, but it’s the unexpected delights along the way which make it. Tonight, it was the smell of onions cooking in ghee (totally expected to smell delish, but every time I find myself saying it out loud to no one in particular), the smell of sliced almonds toasting in a pan, the sizzle as the almonds got added to the curry. Only the cook will get these added bonuses to the meal. It’s like a nifty little secret between the dish and the creator. 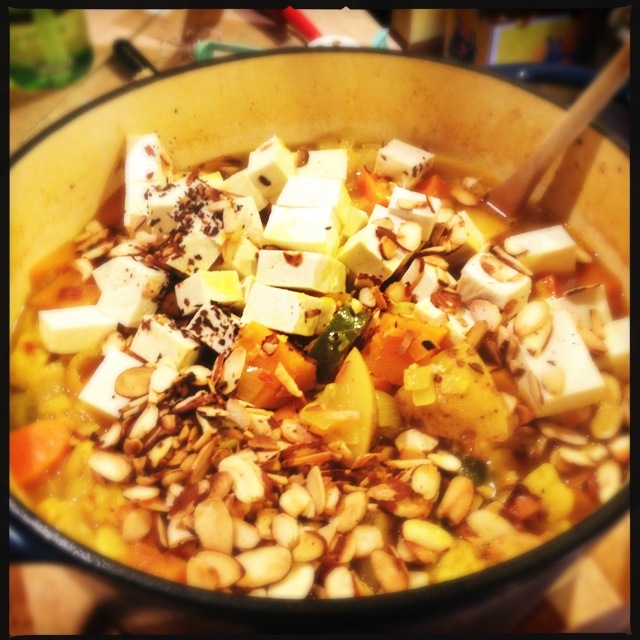 The dish tonight was Winter Vegetable Tofu Korma from 101 cookbooks. This site is a treasure trove of vegetarian deliciousness. I often will print out recipes from the internet. After cooking they will either end up in the recycling bin or in my Pink Folder of Wonder (PFW). All recipes from here are in the PFW. I made a double batch tonight full of pumpkin, sweet potato, potato, zucchinni and carrot. I had the luxury of having my beautiful (and pregnant!!) best friend over this afternoon to entertain Possum while I chopped 2kg of vegetables. Thankyou!! I used my cast iron casserole pot and once the veg and water was in, baked it covered in the oven for just over an hour at 200C. This worked a treat. I was worried the bottom would cook (or burn) before the veg on top was done properly, as the pot was so full. Affordability : EXCELLENT. A massive pot full of delicious spiced goodness for a bargain. the almonds would’ve cost about $4 and same for the organic firm tofu. Would guess at about $1/serve. Time Factor : MODERATE. ~30 minutes prep plus 60 minutes oven time. Thankyou to my best friend for baby entertainment. Life saver! Worth the investment in time for the number of serves you get at the end. Freezer is full after tonight and last night making a big batch of spag bol sauce. Complexity : LOW. A lovely one pot wonder. Deliciousness : EXCELLENT. Quotes from Lego Man tonight: “Is this vegetarian?”, “It’s the nuts that make it”, “You always pick out good recipes” (which I had the remind him about the stuffed vegetable incidents), “this is really tasty”, “did I say that this is really tasty?”. Tummy Filling Factor : EXCELLENT. Yes it’s vegetarian but you have 3 sources of protein with tonight’s meal. 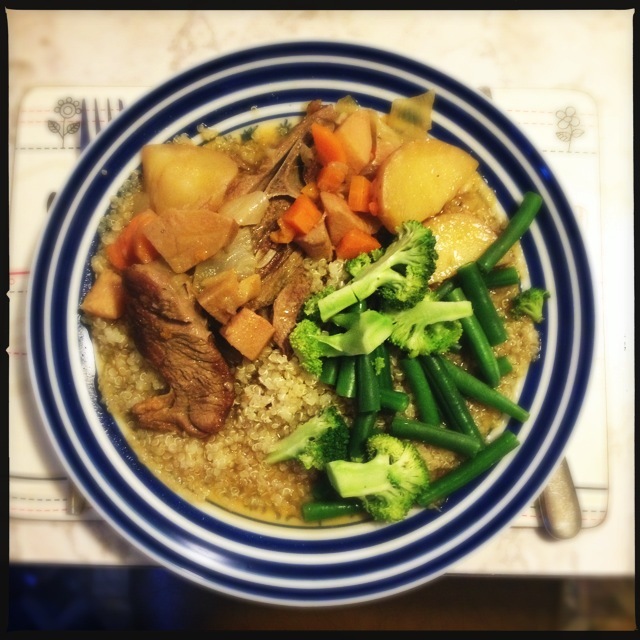 Quinoa (optional extra), almonds and tofu. I couldn’t finish my bowl (that hasn’t happened in a while!). Possum Friendly? EXCELLENT. She loves curry and this has lots of nice soft veggies for her to munch on. She has had almond milk and almond meal already with no reaction but be wary if this is the first time your baby will be exposed to nuts. Would I make it again? Certainly, but with the volume I made I won’t need to make this again until 2016. 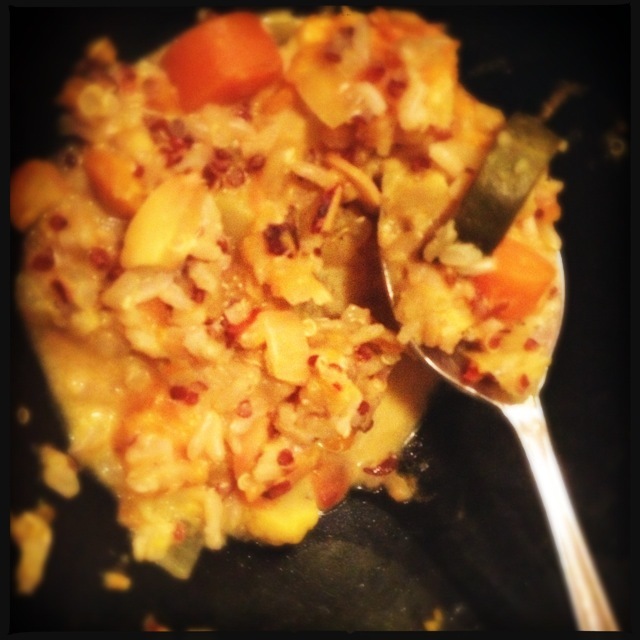 On a side note… Possum went a bit crazy for the risotto from last night. Another Baby Led Weaning win!